What’s next for carpooling at UC? Want to save money, time and seriously reduce your carbon footprint? We have a solution for you! According to the 2016 Travel Survey, 41% of you said that help finding a carpool buddy would influence your decision to choose carpooling as a way of commuting to UC. So to help you find a buddy, UC Sustainability Office set up Carpool Speed Dating! We had a lot of you attend the event looking for commuting love, but we need a bigger and better solution. In answer to this, we’ve created a UC first: a Facebook group for UC car-poolers! We present: UC Carpool. The group is open to anyone from UC to join – staff or students. You’ll be able to join the group, and post your daily commute to campus for others to see and connect with you. Remember to say if you’re a rider or a driver! Tell your friends, classmates and colleagues to help us build the group, and remember even if you only carpool one day a week, you’ll be reducing your carbon footprint and saving money. The Facebook group is supported by the UC Sustainability Office (that’s us!) and we’re here to answer your questions. 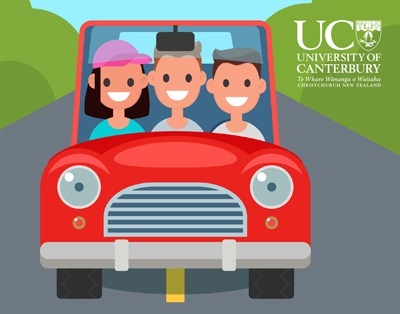 We have more information about carpooling on our webpage, and links to other carpooling initiatives in Christchurch such as Smart Travel to help you connect with your dream carpool buddy. We’ll also post news and any upcoming events in the UC Carpool group, to create a fun and connected carpooling community at UC. Feel free to post and share in the group too! Remember, you can always arrange to meet your potential carpool buddy somewhere before deciding to commit to a ride – if you’re unsure, why don’t you ask to meet them on campus for a coffee first? Don’t be shy! Brought to you by the UC Sustainability Office. Stay connected, follow us on Facebook or Instagram, or check out our website for more information about what we do and upcoming events.